Oh no! Our ruler is broken and no longer starts at 0! That's okay. We can still use the ruler to measure lengths! 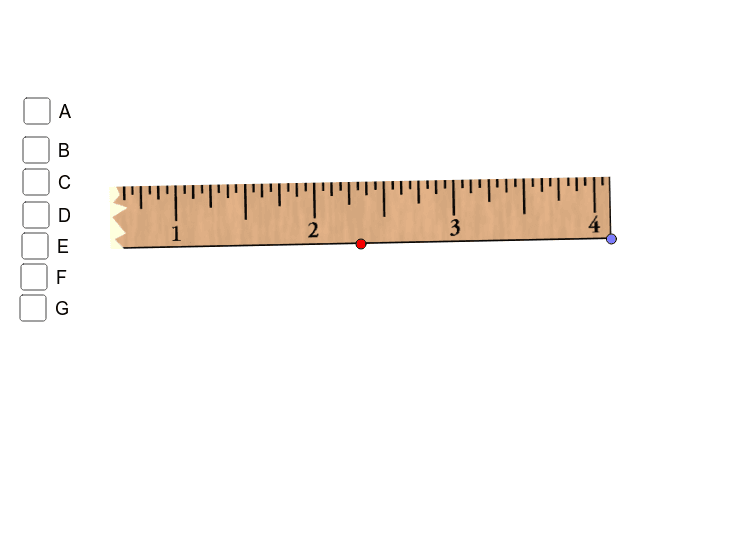 To Use the Ruler: The red point moves the ruler. The blue point rotates the ruler. Measuring Segments. Select which segment you want to measure (A - F). You can only measure one segment at a time. Choose a starting point on the ruler to use to measure the segment. Use the red point to move the ruler and the blue point to rotate the ruler to align it with the segment. Think you know the length of the segment based on the broken ruler? Enter the length into the input boxes. You can enter a proper fraction, improper fraction, or mixed number based on the length of the segment.